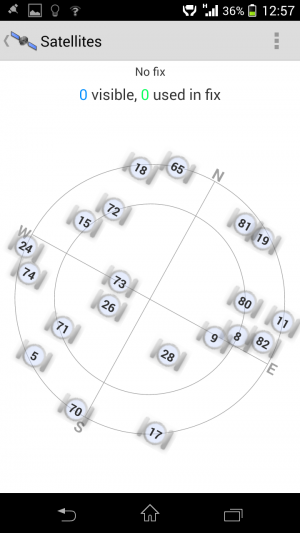 This article is about checking GPS reception. If you are interested in frequently asked questions about GPS and your location, then click here. In Loquiz outdoor games GPS is needed to open tasks with locations. As the GPS system is based on satellites, good satellite reception is needed to play satisfying game. Luckily most of the devices have inbuilt GPS receiver. Newest devices use Glonass (Russian) and Navstar (American, also known as GPS) together. not able to connect to the satellites due to obstacles (narrow street, dense forest etc.). GPS – accuracy around 10 m.
Device will use the best that is available and so will Loquiz. Loquiz only takes the location stream from the device. We can not unfortunately control or manage the internet connections. If your location accuracy is worse than 100 meters, Loquiz do not calculate your position. How to check the reception? There is very little you can do about better GPS reception but you can check if the problem is with reception. 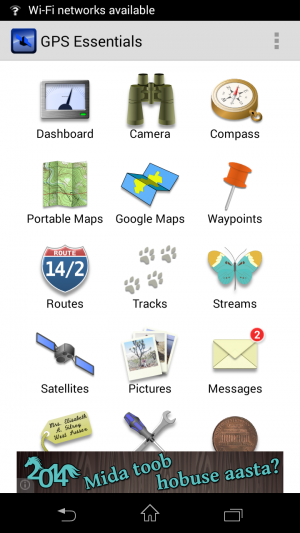 Great free app to check it on Android is GPS Essentials. You can download this app via Google Play store. Start GPS Essential on your device. Click on “Satellites”, this will take you to the satellite screen. There you can get a very quick overview of what satellites are available out there, if there is a fix and what is the estimated accuracy. All the satellites that are connected to the device are marked in blue (on the screenshot there are no active connections) and all the satellites that are used for fix are marked in green (no position in the screenshot). But you can do much more. Click on Dashboard, there you can add a couple of useful attributes (under “+” sign). Location provider show what kind of network (GPS, Wifi or Cellular) you are using. Number of satellites show how many satellites are visible and used. 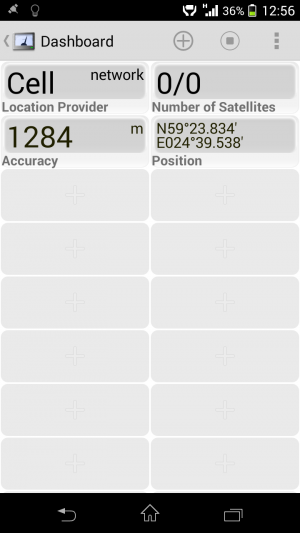 Accuracy shows the estimated GPS accuracy in meters. So on the screenshot below those settings are not really very favourable. Fix to at least 4 satellites is needed to get location! Give the device some time to achieve the first lock always! Restarting the application forces the device to reinitialize GPS chip, so this might help if nothing happens, but do not rush it. What can you do to improve the location accuracy? Move outdoors (GPS does not work indoors), move to open area (GPS works poorly on narrow streets and near large objects). Use bigger radiuses in your game, locating points in open areas will help in general. In rare occasions where satellite connection is systematically weak (not just because of obstacles) it will usually improve over time. If you want to go really deep check the GPS.GOV page.